Using strands of genetic material, Purdue University scientists have constructed tiny delivery vehicles that can carry anticancer therapeutic agents directly to infected cells, offering a potential wealth of new treatments for chronic diseases. WEST LAFAYETTE, Ind. – Using strands of genetic material, Purdue University scientists have constructed tiny delivery vehicles that can carry anticancer therapeutic agents directly to infected cells, offering a potential wealth of new treatments for chronic diseases. The vehicles look nothing like delivery trucks, though that is their function once inside the body. Instead, these so-called nanoparticles, which are assembled from three short pieces of ribonucleic acid, resemble miniature triangles. The microscopic particles possess both the right size to gain entry into cells and also the right structure to carry other therapeutic strands of RNA inside with them, where they are able to halt viral growth or cancer's progress. The team has already tested the nanoparticles successfully against cancer growth in mice and lab-grown human cells. "RNA has immense promise as a therapeutic agent against cancer, but until now we have not had an efficient system to bring multiple therapeutic agents directly into specific cancer cells where they can perform different tasks," said research team leader Peixuan Guo, who is a professor of molecular virology at Purdue with joint appointments in Purdue's Cancer Research Center, School of Veterinary Medicine and Weldon School of Biomedical Engineering. "Physicians have hoped that nanotechnology might provide a solution to the problem, and it's possible that the application of these tiny triangles could lead to the solution." "With these devices, Dr. Guo was able to deliver three different therapeutic agents into a cell at the same time," said Jean Chin, a scientist at the National Institute of General Medical Sciences, which is part of the National Institutes of Health. "This is an incredible accomplishment that points to the versatility and potential medical value of these nanoparticles." The research appears in two related papers being published in the scientific journals Nano Letters and Human Gene Therapy. Members of Guo's research team are from Purdue, the University of Central Florida and the University of California, Riverside, including Songchuan Guo, Annette Khaled, Feng Li, Sulma Mohammed and Nuska Tschammer. Guo's team created their nanoparticles by linking together different kinds of RNA, a task that their previous research has given them ample opportunities to practice. Several years after building a tiny "motor" from several strands of RNA that mimic those in a bacteria-killing virus called phi29, the team learned how to manipulate these stringy molecules into different shapes, including rods, triangles and arrays. "We speculated at that time that these shapes would be useful purely as physical scaffolding on which more sophisticated nanodevices could be constructed," Guo said. "But RNA, which carries genetic messages within cells, also has many therapeutic functions. We realized that if we built different kinds of therapeutic RNA onto the RNA scaffolding and created a single structure, we might be able to respond to several challenges that have confronted the medical field." RNA molecules come in many variant forms, and the sort that the team mimicked from the phi29 virus – called pRNA – also can be linked to other types of RNA to form longer, hybrid strands with properties the researchers could assign. "We looked around for RNA strands that would behave in certain ways when they encounter a cancer cell because each of them needs to perform one step of the therapy," Guo explained. "An effective agent against cancer needs to accomplish several tasks. It needs first to recognize the cancer cell and gain access to its interior, and then it needs to destroy it. But we'd also like the agent to leave a trail for us, to mark the path the molecule has taken somehow. That way, we can pinpoint the location of the cancer and trace the outcome after the treatment." To accomplish these tasks, the team turned to other forms of RNA that can interfere with the goings-on inside cells. The team sorted through a variety of RNA forms that have shown promise for disease treatment and found three that could perform each of the desired tasks. One example is "small interfering RNA," or siRNA, which deactivates certain genes in cells. The others are RNA aptamers, which bind to cancer cell surface markers, and ribozymes, which can be designed to degrade specific RNA in cancer cells or viruses. "We linked each of the three therapeutic strands with a piece of pRNA, forming three hybrid strands," Guo said. "Then, using techniques we learned from our earlier work, we were able to combine all three into triangles that are between 25 and 40 nanometers wide. This is the Goldilocks size for any nanoparticle that is to be used in the body – not too big, not too small." Particles larger than about 100 nanometers are generally too large to pass through cell membranes into the cell's interior, Guo said, and the body has a hard time retaining particles smaller than 10 nanometers. But the tiny triangles fit, and they worked well enough to interrupt the growth of human breast cancer cells and leukemia model lymphocytes in laboratory experiments. "One characteristic of cancer cells is that they do not stop growing, which is one reason tumors develop," Guo said. "Once inside, the siRNA essentially instructs the cells to 'stop not stopping.' The nanoparticles had done their work on the breast cancer cell cultures within a few days." Additionally, the team found that the nanoparticles completely block cancer development in living mice. A group of mice that were in the process of developing cancer were tested with the nanoparticles, and they did not develop the disease. A second group that was tested with mutated inactive RNA all developed tumors. "The results are very promising, but we still have several hurdles to jump before we can test this therapy on people," Guo said. "First and foremost, we must ensure that it is as safe as we think it is. Some RNA can be toxic to noncancerous cells as well, and though our nanoparticles appear to go straight to the cancer cells where we want them to go, we have to be sure they do not go anywhere else before we can inject them into a living person." Stability of the RNA also is a factor the team must consider. Although they previously published data indicating that phi29 RNA nanoparticles are more stable than other RNA, Guo said the team still needs to find better ways to protect the RNA from degradation by enzymes in the body. Although the group still needs to prove the safety of their tiny creations, Guo said, they remain confident that their work is a milestone for medical nanotechnology. The team has already obtained further results that could help create safer RNA nanoparticles. "Many studies have shown that therapeutic forms of RNA, such as siRNA or ribozymes, could be put together to kill cancer, but the main obstacle has been finding the delivery method that can bring them to specific cells simultaneously," Guo said. "Nanotechnology is beginning to pay off here in that it may have provided us with a solution to the problem. We hope to enhance the work we have done so far and refine it for human trials." The team's work is supported in part by grants from the National Institutes of Health and the Department of Defense. Guo is affiliated with Purdue's Cancer Center and Birck Nanotechnology Center. The Cancer Center, one of just seven National Cancer Institute-designated basic-research facilities in the United States, attempts to help cancer patients by identifying new molecular targets and designing future agents and drugs for effectively detecting and treating cancer. The Birck Nanotechnology Center is located in Purdue's new Discovery Park, located on the southwestern edge of campus. Programs include undergraduate teaching, graduate research and technology-transfer initiatives with industry partners. Scientists in biology, chemistry, physics and several engineering disciplines participate in the research. Utilizing RNA nanotechnology, therapeutic siRNA and receptor-binding RNA aptamer were engineered into individual motor pRNAs of phi29. 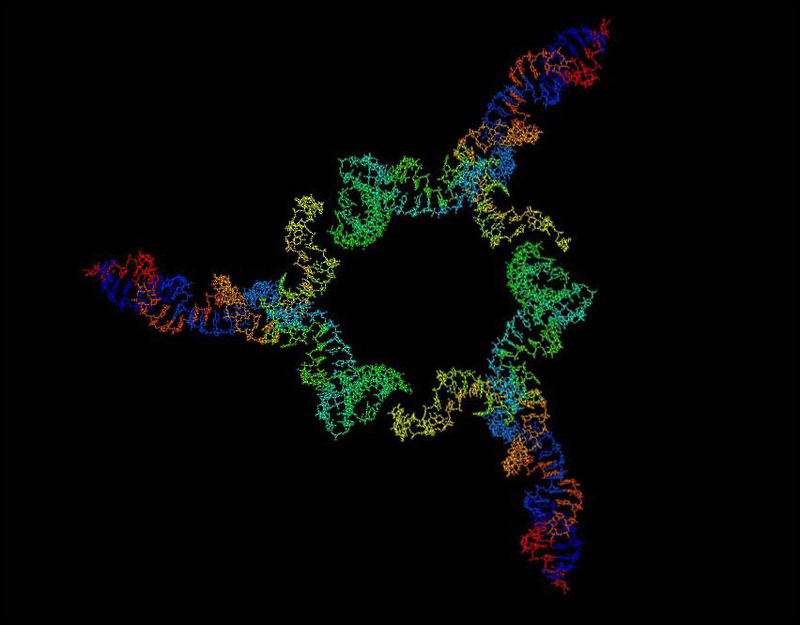 The RNA building block harboring the therapeutic molecule was subsequently fabricated into a trimer by utilizing engineered right and left interlocking RNA loops. Incubation of such nanoscale devices containing receptor-binding aptamer or other ligands resulted in binding and co-entry of the trivalent therapeutic particles into cells, subsequently modulating the apoptosis of cancer cells and leukemia model lymphocytes. The application of small RNA in therapy has been hindered by the lack of an efficient and safe delivery system to target specific cells. Packaging RNA (pRNA), part of the DNA-packaging motor of bacteriophage phi29(29), was manipulated by RNA nanotechnology to make chimeric RNAs that form dimers via interlocking right- and left-hand loops. Fusing pRNA with receptor-binding RNA aptamer, folate, small interfering RNA (siRNA), ribozyme, or another chemical group did not disturb dimer formation or interfere with the function of the inserted moieties. Incubation of cancer cells with the pRNA dimer, one subunit of which harbored the receptor-binding moiety and the other harboring the gene-silencing molecule, resulted in their binding and entry into the cells and subsequent silencing of anti/proapoptotic genes. The chimeric pRNA complex was found to be processed into functional double-stranded siRNA by Dicer (RNA-specific endonuclease). Animal trials confirmed the suppression of tumorigenicity of cancer cells by ex vivo delivery. It has been reported [Shu, D., Moll, W.-D., Deng, Z., Mao, C., and Guo, P. (2004). Nano Lett. 4:1717—1724] that RNA can be used as a building block for bottom-up assembly in nanotechnology. The assembly of proteinfree 25-nm RNA nanoparticles reported here will allow for repeated long-term administration and avoid the problems of short retention time of small molecules and the difficulties in the delivery of particles larger than 100 nm.